Happy “Twerking” on the 4th of July! As you gather with your friends and loved ones today to celebrate our independence, by grilling, eating burgers and hot dogs, having a huge piece of Aunt Maude’s flag-shaped cake, downing some store-bought star-shaped cookies, having two helpings of over-mayonaised potato salad, lot’s of chips, beer, lemonade and candy, don’t forget to twerk! Everyone is doing it and so can you. Miley Cyrus is doing it. Rhianna‘s got it going on. 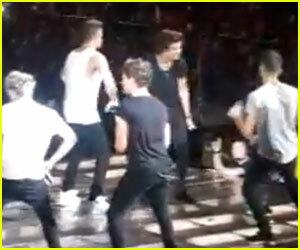 Even the group, One Direction, is twerking away! It’s the activity of the Summer of 2013! Got a pool? No problem. You can twerk underwater! You can all thank me later for enlightening you, once again, with the latest craze. I was off the grid so I missed this post. Man, I would have been a hit a the party on the 4th. You know, because I don’t think I could have really pulled that off. This twerking craze needs to go away. Far away. I am so sick of opening the internet and seeing Miley Cyrus’s backside. My family did its part on the fourth!!!! No way! Never heard of this. Tried it, but no luck. Great picture, btw. From the wedding? They are turning…I mean, twerking in their graves as we speak! Maybe we can get more of an idea of this twerking if you showed us a picture of you doing this ….in your new blue bathing suit???? 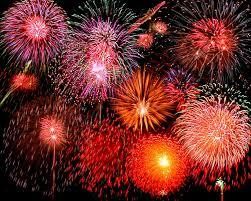 Happy Fourth Ms. 50ish!! As always, your posts crack me up, Maria! Thanks for introducing me to, “Twerking”…I’ll give it a try. 🙂 Happy 4th of July! So…uh… educational! Admittedly, I had no knowledge of this “twerking” you speak of… and now feel I may know too much. Wish I had a “badonkadonk”, maybe I, too, could twerk! Aw Heck…. my twerking days are gone… I’ll stick with burgers and fireworks today. I can’t erase the image of Miley tweaking. We need Tebow tweaking and we are all set. Spell check instead on calling it tweaking and not twerking. I gave up trying to fix it.